It was a another cloudy day with odd spells of sunshine later in the day but no wind. The path was very busy in places, well near car parks & villages, perhaps the National Trust should consider dualling them 🙂 The ferry at Fowey was a bargain, £1.60 to Polruan in 8 minutes. The scenery is, as always, stunning if you omit the disaster zone called Par, disused factories, paths full of dog poo and a general air of neglect made it the sore thumb in Cornwalls lovely coastline. 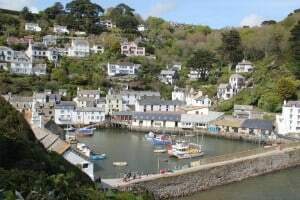 The highlight was Polperro which is my favourite place in Cornwall so far, mainly because it was car free and the harbour is been looked after by local people for local people. Another beautiful spot was the Menabilly beach house made famous by Daphne du Maurier. So a walk of contrasts today! Tonight I’m at the Schooner Point which can claim to have the most powerful shower so far encountered by me on this trip and a reasonable WiFi too.